I’ve taken on Linux a few times, tried everything from Ubuntu to Mint, even tried setting up and running Gentoo on my own. In the end however, I always default back to Windows. I don’t know if it’s because I’m an avid gamer and installing games on Linux can be a pain or if it’s because researching problems I run into becomes overwhelming or what. But after reading a bunch of your articles on Datamation, especially the W10 Vs Linux one, I’m tempted to try it again…. My question would be, what do you recommend for distros? I’m a rather tech savvy person myself, I was a computer technician and an internet technician for 4 years, although I understand that hardware/software and fixing windows is a lot different than Linux and I think that’s where my problem lies. I’m all ears and looking for more advice from someone who seems to have an amazing understanding of the systems. I totally understand your frustration with trying to make the switch to Linux, while maintaining your sanity as well. Most of the time Linux issues receive a heavy-handed response when the same sort of issue with Windows is usually “allowed” by the masses. I know, I used to do this myself way back when. With any luck, the following recommendations will help you along your way. First off, allow me to recommend my favorite Linux distribution – Ubuntu MATE. My main PC’s Linux distro is Ubuntu MATE 14.04. I found it to be stable to use and highly customizable. I also like the direction the distro is heading in with regard to adding new features. For example, the Ubuntu MATE 15.10 release will provide a new tool called Ubuntu MATE Welcome. This tool will provide a solid starting point where the new user can get needed applications, find support, and even have a place where they can get involved with the project. This is the distribution I recommend hands down. Now the next consideration when trying out Linux is determining the compatibility of the hardware you’re running. While most things work just fine out of the box, every once in awhile you may have issues with video/audio/wifi. Below, I’ll share some tips on how to tackle these challenges by providing links to support forums with the information they need to be of assistance. Before I jump into this, remember the following: When asking for help, never post without being explicit about exactly what you did to get to the error and what hardware you have. Usually, the worst example is “my _____ doesn’t work.” Folks in the forums need to know what sort of hardware you’re dealing with. So if the issue is video related, then video card (model, brand) details are critical. Same applies for audio and wifi issues. How do you know what hardware you’re running? From a command prompt (terminal), use the following tools to help determine what your hardware is. The following assumes you’re running an Ubuntu based distribution such as Ubuntu MATE. Note that with USB, sometimes the resulting names listed may seem different than the brand you have in front of you. For example, sometimes running lsusb only provides details that don’t make any sense. In the past, I’ve seen Ingram and Jing-Mold Enterprise Co., Ltd listed. Neither of these lsusb results mean anything to me. I’m presented with “iProduct” names: “Ingam” represents my USB Gaming Mouse and “Jing-Mold Enterprise Co., Ltd” represents my USB keyboard. This information is helpful as it identifies which items are hubs, keyboards and mice. If using the command line isn’t for you, then you can install a program called CPU-G if you have a working Linux desktop environment on the PC in question. For Windows refugees, this will feel very familiar. It provides you with your CPU, Motherboard, RAM, and system details. To install CPU-G, you’ll need to add the software repository so it can be installed and Ubuntu updates will keep it current with new releases. 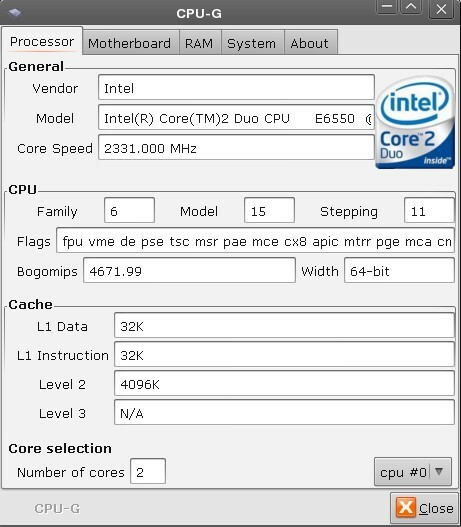 Once completed, CPU-G appears under Applications>System Tools. The next and perhaps biggest consideration for a new Linux user is software discovery. For Ubuntu MATE users, I recommend installing AppGrid. Some Linux users aren’t fans of it since its source code isn’t open source, however it’s by far easier to use than the alternatives I’ve tried in the past. It provides you with a visual source of software discovery, regardless of it’s software license. Starting with Ubuntu MATE 15.10, you’ll also have access to a tool called Ubuntu MATE Welcome (mentioned previously) which will help provide a solid launching point for applications most people might consider critical. The importance of providing the correct hardware information. Tools to discover and install software. Which Linux distribution I recommend. If you follow the advice above, I have no doubt that you’ll have a good time diving into Linux on the desktop and throughly enjoy the experience. Before taking the next step and installing Linux onto your hard drive, remember this: run a live installation on a USB key first, since it won’t touch your hard drive. Test out playing audio, video and wireless networking. If you’re happy with the results, then you can look into installing it along side Windows so you don’t have to give up any games.